‘!No todos somos iguales!’ (‘We are not all the same! ), exclaimed former Health Minister Carmen Montón in self-defense during a September press conference, prior to resignation from her post after being caught up in the so-called ‘Mastergate’ scandal at Madrid’s Universidad Rey Juan Carlos (URJC). And, on Wednesday a Madrid judge agreed, dismissing charges that Montón had participated in falsification of grades received for coursework toward a Master’s Degree she received from the university. Montón, formerly a Socialist party Health Minister in the Valencia regional community who this summer successfully shepherded universal healthcare through Spain’s Congress as Health Minister under President Pedro Sánchez, was forced to step down from her post as several politicians and their allies came under scrutiny in the ‘Mastergate’ scandal. But, while Montón was resolved from wrongdoing by Judge Carmen Rodríguez Medel, former Madrid regional President Cristina Cifuentes of the Partido Popular (PP) was not so fortunate. 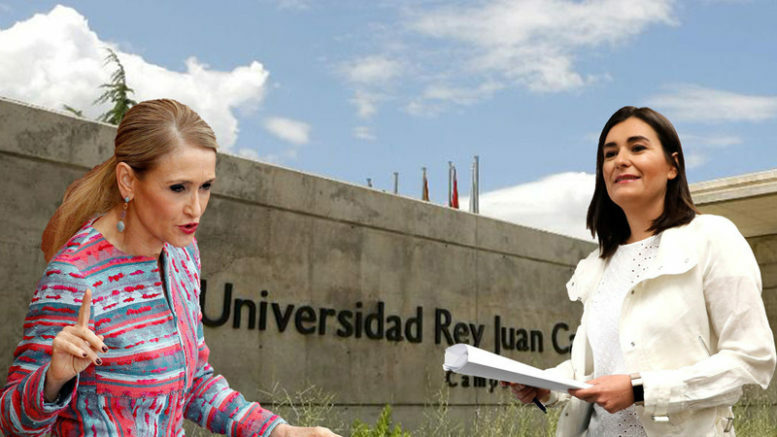 On Wednesday, the judge ordered Cifuentes to stand trial on charges that she conspired with university officials to falsify grades, attendance records and the certification of her thesis for a Master’s Degree that the university awarded her. The Mastergate scandal erupted in April, when Spanish newspapers leaked documents suggesting that Cifuentes had never attended classes nor turned in coursework, while professors on her Master’s thesis panel never signed the certification document that granted her the degree. When she refused to step down from the Madrid regional presidency to face the allegations, a leaked video showing Cifuentes being arrested for shoplifting face cream from an Euroski supermarket forced her resignation. The scandal threatened to engulf the newly elected Partido Popular leader Pablo Casado, also the recipient of a Master’s from the same institute at the URJC, until Spain’s Supreme Court decided to dismiss the charges against him due to insufficient evidence. In the midst of the scandal, the doctoral thesis of Pedro Sánchez was even called into question, but allegations of his having cut-and-pasted sections of the thesis from other works fizzled when multiple computer analyses showed incidences of copying to be minimal. In a statement Wednesday, Montón reiterated that her original explanation of the anomalies in her Master’s Degree had been given “honestly, transparently and renouncing her (Congressional) immunity” from prosecution so she could be cleared of any wrongdoing, which she said the judge’s ruling had now done. The former Health Minister did not say if she would be returning to government in the future.